【Space Saver Design】: Foldable design and transportation wheels allow for easy mobility and portable foldable treadmill for storage,fold it up and walk away-in one easy step,pefect for home , dormitory, office use.Sturdy steel frame, durable to use; support maximum weight up to 256lb. 【APP CONTROL & SMART SYSTEM & 3 Level Maunal Incline】: Get your personal trainer & health report as well as control the running machine through the Bluetooth FitShow Sports APP, Android and IOS system compatible; designed with 0.8 - 12 KM/H speed levels .Meanwhile we also designed this machine with manual incline settings. 【12 Preset Training Plans & Heart-Rate Sensor】 - To burn calories more effectly, we specially programmed 12 different running setting, with the help of these preset training plans and heart sensor, so you can select different speed and programs base on your physical condition and index. 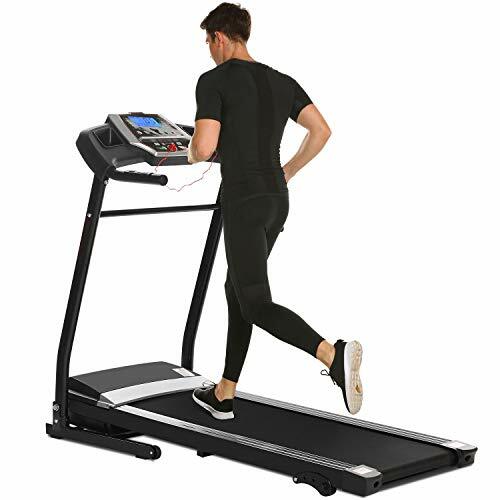 【Low Noise Motor & Safety Function】: Low noise motor and auto-stop safety function,the treadmill equipped with the safety key so it can stop immediately in emergency situations-Double safety protection.Level 6 damping system, high strength, high density, high elasticity double deck running board, anti-slip anti-static lawn texture belt.The 2.25HP motor ensures perfect performance for walking, jogging, running and cardio workout at home. 【Warrenty & VIDEO INSTALLATION GUIDE】; US STOCK，1 year warranty & Friendly Customer Service; Please search r4AcTed1Awc on Youtube to access to video installtion Guide.